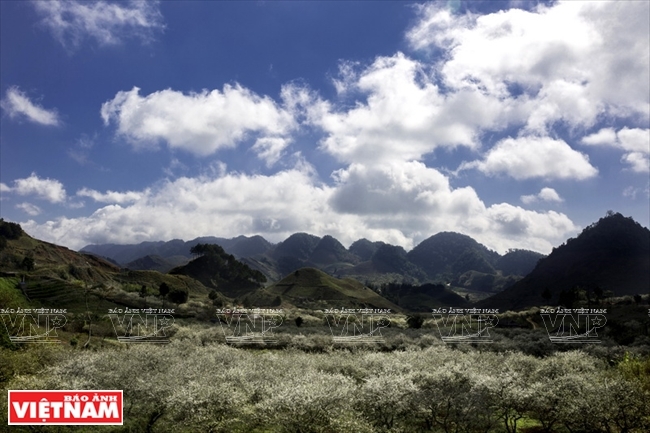 Moc Chau plateau is located in the two districts of Van Ho and Moc Chau in Son La province. 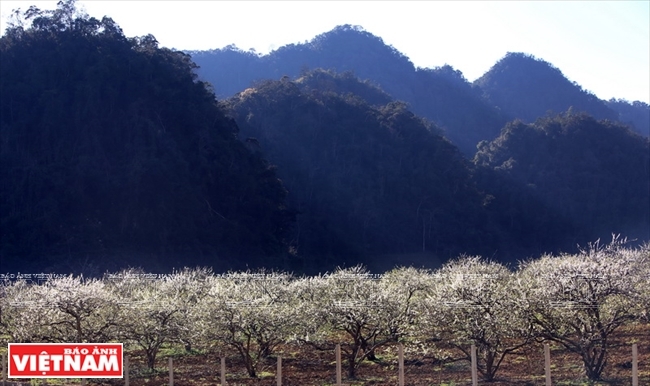 Various kinds of flowers are abundant all year round and it is considered the “Da Lat of the northwest”. 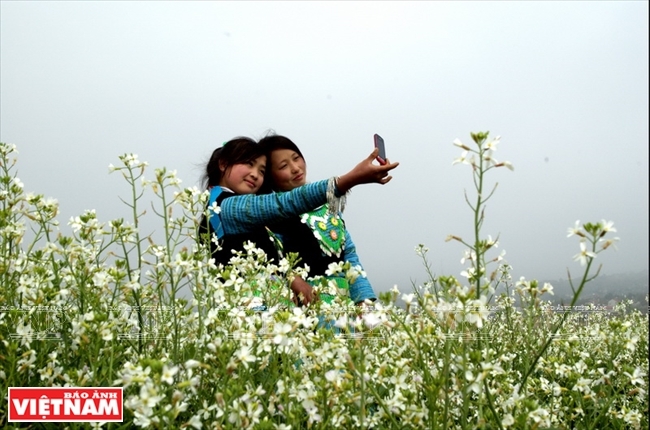 Vast valleys of white plum flowers, forests of flame peach blossoms, and fields of mustard flowers stretching to far-away hill sides, all attract a great number of visitors to the fresh and green plateau. 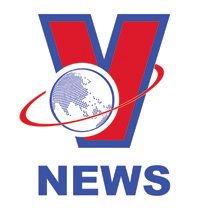 Up to 1,200 hectares of land are used for plum growing, mainly in Loong Luong and Van Ho communes of Van Ho District, in Nong Truong, Tan Lap and Muong Sang of Moc Chau district. 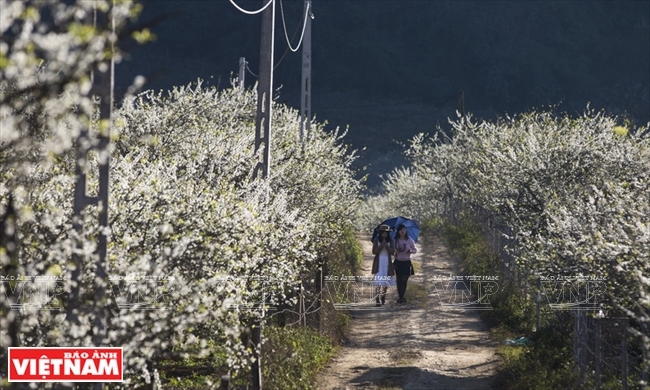 Plum flowers are in every hamlet and valley with their pure white color in the early days of 2018. 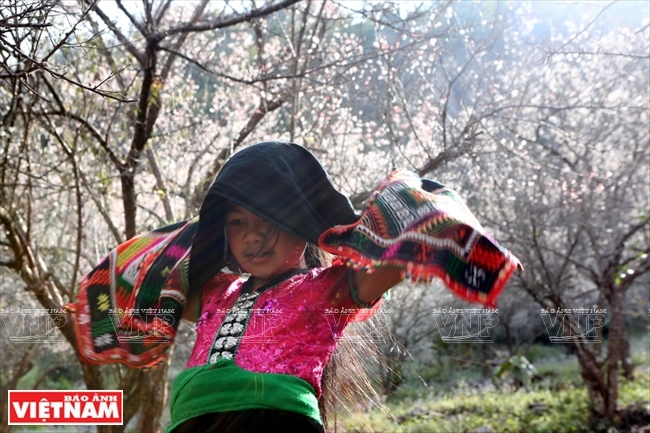 A circle of life of the plum tree, from flower to fruit, is introduced to visitors through tourist packages, and the key one is the Plum Picking Festival to be held in Na Ka every May. 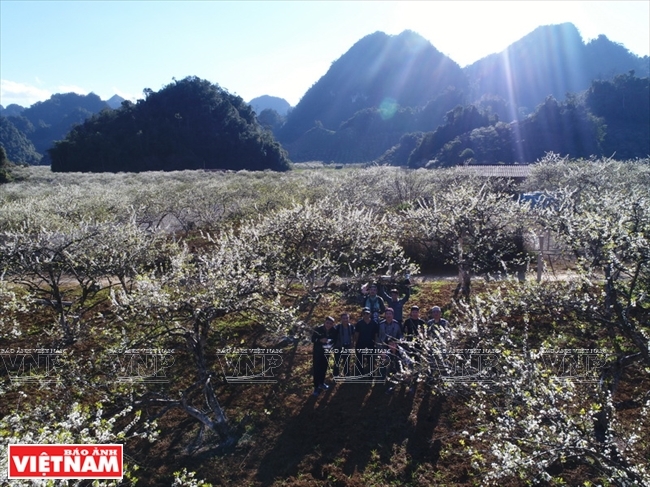 Plum flowers are blooming during the time when the local Mong in Moc Chau and Van Ho celebrate their traditional New Year’s festival. 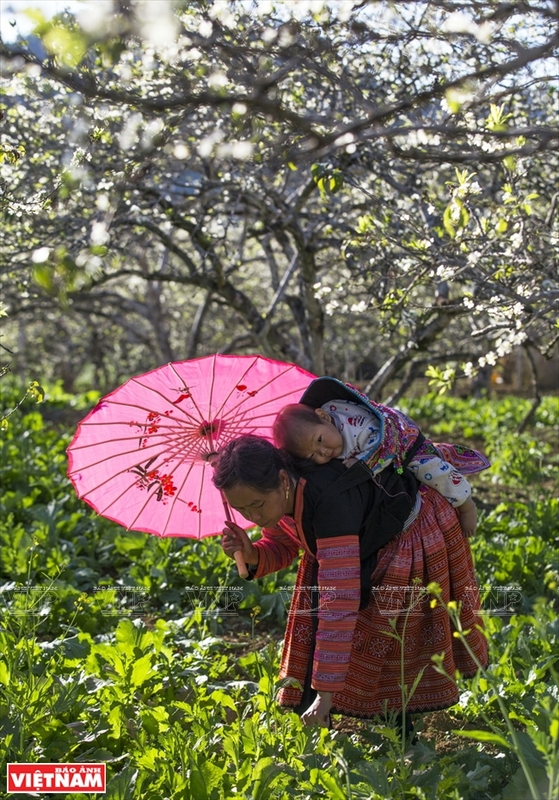 In the villages of Na Ka, Ba Phach, Chieng Di and Loong Luong, plum flowers are blossoming all over the mossy roofs of houses, along the paths leading to the hamlets, and in the fields. 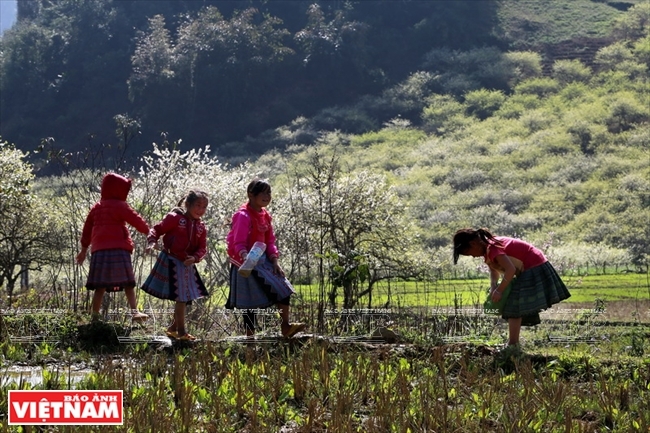 The white color helps highlight the colorful dresses of the Mong women going to the festival, making the highland landscape as beautiful as a painting. 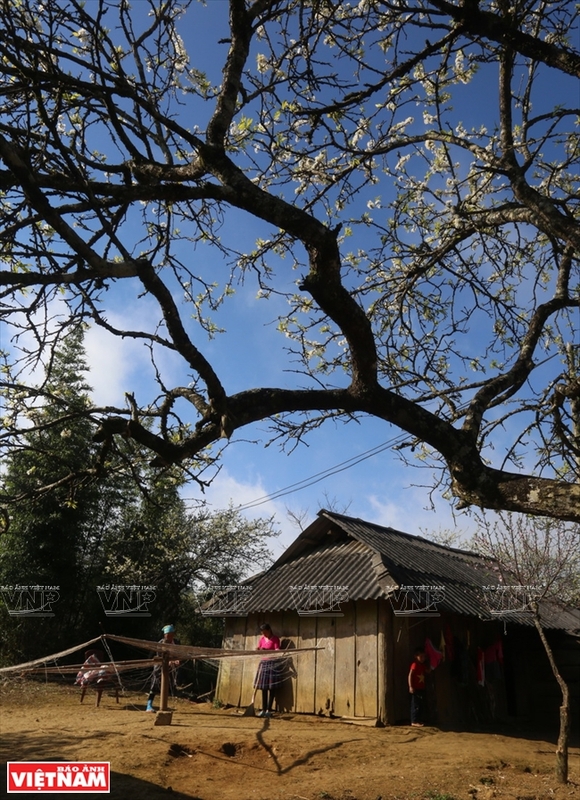 A Mong woman embroiders under plum trees in Chieng Di village 1, Van Ho district. Plum flowers blossom beautifully only for two weeks. 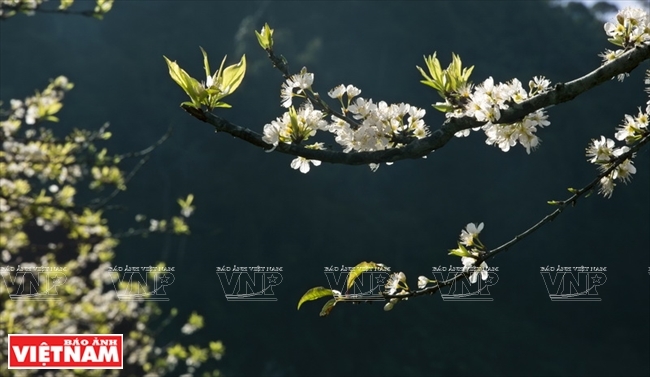 If plum flowers represent pure and fresh beauty, peach blossoms remind one of their fragility and fullness of vitality. 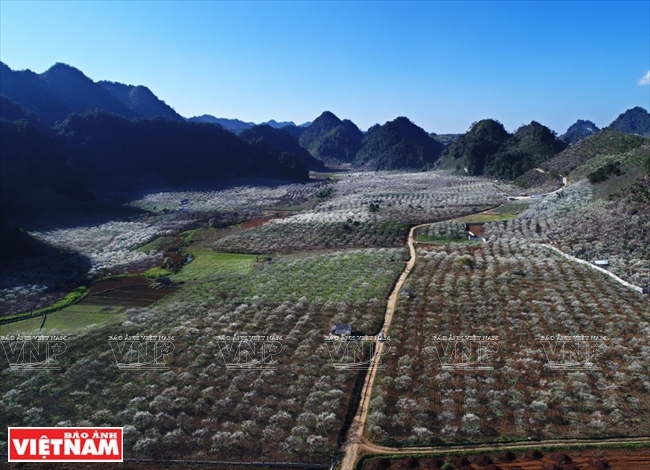 Compared to the previous years, peach blossoms are blooming on Moc Chau plateau ahead of the lunar New Year festival. 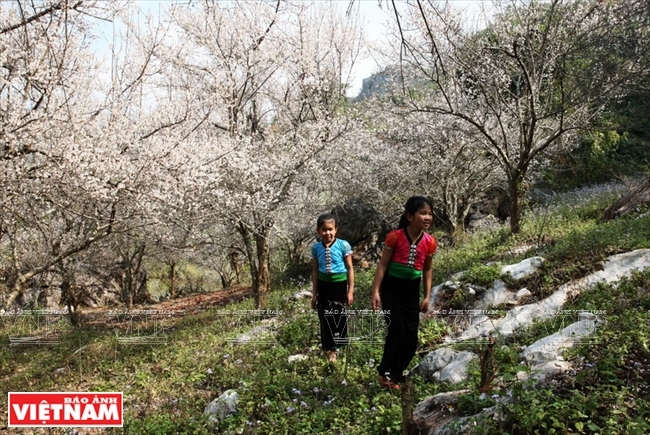 On February 2-3, a peach blossom festival was held in Van Ho district to introduce the growth of mountain peach plants as well as the cutlure of ethnic minority people in the district. Forest peach trees are difficult togrow in the northwest. They grow thanks to the soil amid rocks, and the mist and wind, not because of man’s care. 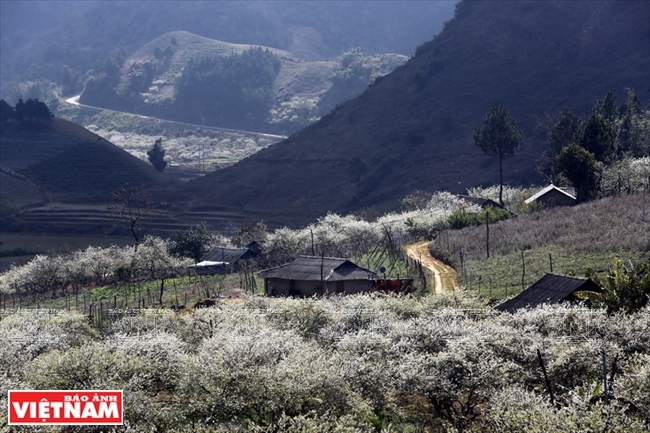 Peach blossoms are blooming all over the grey mountainsides, along the roadsides, amid plum flowers, and around houses, providing a warm outlook over the plateau. 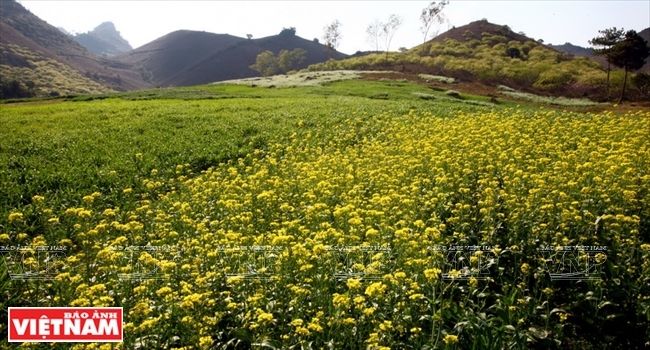 Around mid-November, when the first cold wind of winter is blowing, it’s time for mustard flowers to fully bloom on Moc Chau plateau. 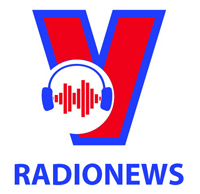 The Mong and Thai people grow rows of mustard plants to get seeds, so mustard flowers will bloom for three months until late January. There are many places to see mustard flowers in full bloom, and the most beautiful ones are in Ba Phach, Ang, Thung Cuong and Bua villages. Each site has its own beautiful view that is quite differentfrom the others. 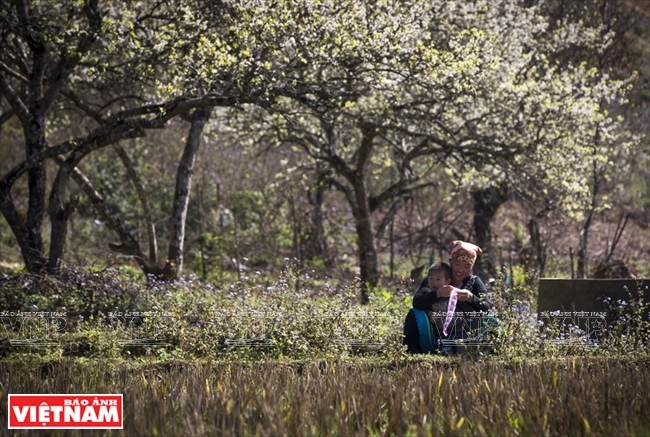 The path that leads to Ba Phach village is covered in fields of mustard flowers along the way. White mustard flowers are overwhelming the entire area where there are some rough, uneven soil paths and small houses of the local people. 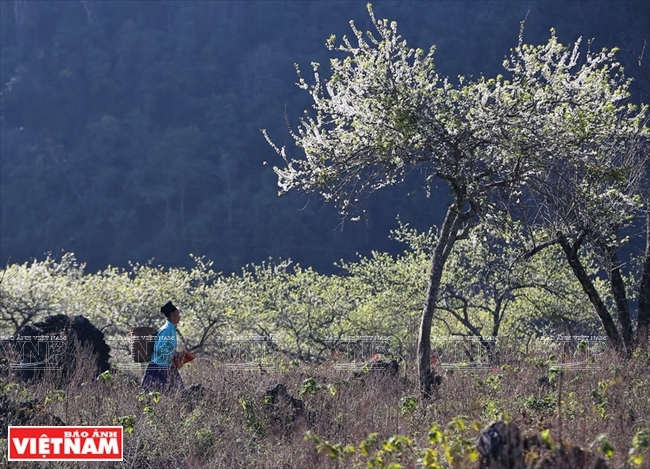 Ba Phach has a nickname, “a paradise of mustard flowers” on Moc Chau plateau, an ideal destination for photographers. Ba Phach mustard flower field in Nong Truong township is a favourite destinaiton of photographers. 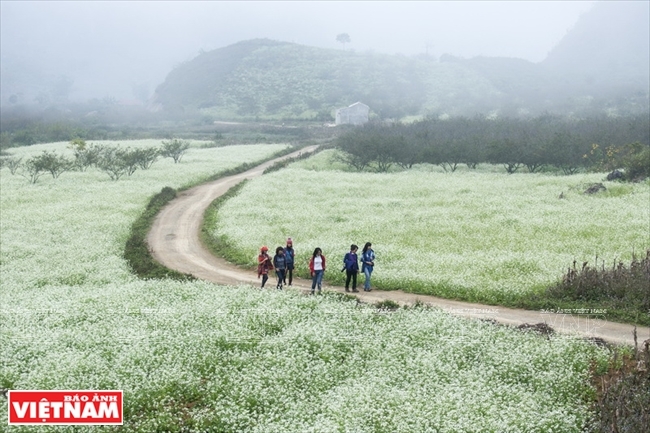 There are also other kinds of flowers blooming all year round on Moc Chau plateau, including daisies, apricot flowers, poinsettias and orchids. All make the landscapes so romantic. 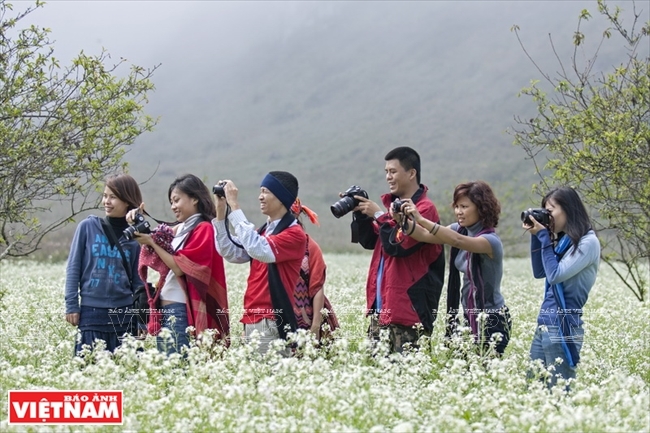 Visitors to Moc Chau plateau have a feeling that they are contemplating a perfect beauty, which is like that of a young girl with a wild and mysterious beauty.